Aperture 3 supports tethered shooting with a host of Canon and Nikon DSLRs. But iOS devices work quite well too. Simply connect an iPhone or iPad via the USB cable to your Mac, then start a tether session in Aperture (File > Tether > Start Session). A tether session in Aperture using the iPad mini as the camera. 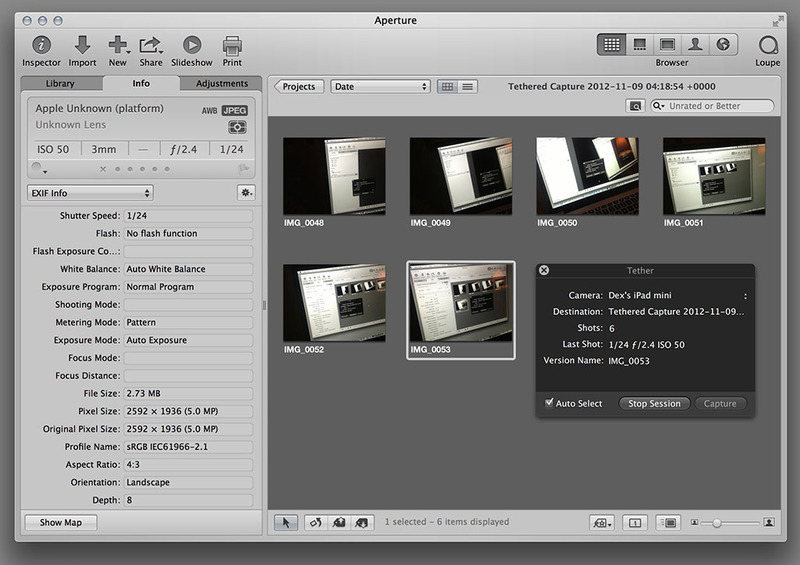 When you tap the shutter release button on the device to take a picture, Aperture grabs it and displays the image. This setup can be handy for all sorts of situations, such as product shoots and portraits where the large composing screen makes the job easier, or in the classroom with lots of kids. And since the built-in camera is actually quite good with the iPhone 4S and iPhone 5, plus the latest iPads, the main limitation is the software controlling the camera. The built-in Camera app is basic at best. But you're not limited to that software. An excellent app, ProCamera ($2.99, iPhone and iPad versions) provides much more sophisticated controls, and works in tethered mode with Aperture. 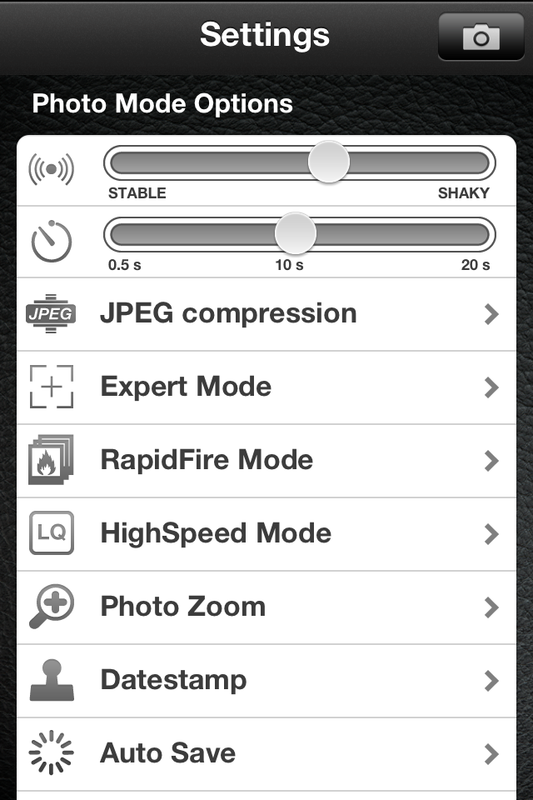 ProCamera adds helpful features such as: anti-shake, self timer, virtual horizon, grids, white balance lock, separate exposure and focus controls, JPEG compression setting, sound trigger, and more. Plus it's easy to use. I'm not saying that your iPhone or iPad will always replace the DSLR for a tethered shoot. But the iOS setup is sure a lot easier. And there are many situations, especially in the classroom, where a tethered iPad or iPhone is a heck of a lot easier to manage. I have a training movie on tethering with an iPhone in my Aperture 3.3 Essential Training (2012) on lynda.com. It's just one of the tutorials in the 8+ hours of instruction. Also, take a look at our Aperture 3 Learning Center. Tons of free content about how to get the most out of Aperture.